"Excellent study guides for apprentices, electricians, inspectors, technical schools and even for the electrical engineer that had zero hours of Code study at the University." "Instructors are always looking for extra material to teach the code, now it's available!!!" "Now you can SEE the Code in pictures of the Electrician's everyday applications!" Most likely you've heard the expression, " A picture is worth a thousand words." I've always maintained a smile means the same in any language. A picture is like a poem without words. In my writing books I take text and massage it and put it into a picture where possible. 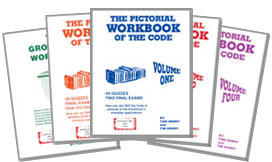 I have written 5 volumes "The Pictorial Workbook of the Code" which covers the first five chapters of the code in pictures. The first five chapters, I have always referred to as "the meat of the code." The 5 volumes "The Pictorial Workbook of the Code" are excellent study guides for the apprentices, electricians, inspectors, technical schools and even for the electrical engineer that had zero hours of code study at the University. The 5 volumes total 1,721 Code questions with answers, 165 quizzes or exams, 9 final exams with answers and Code references. These volumes are great for an instructor teaching the Code. There's a tremendous amount of work that must be done in electrical training. The one area I feel we are lacking in is "learning" the Code. You can't just read the Code book, it must be taught to you. Today, electricians must be better than they have ever been. With the tremendous growth in technology, new products, new wiring methods, etc. The industry has moved forward while many of us have stood still. Many electrical jobs are in jeopardy because individuals have stood still. With the increasing threat of legal liability, it is time the electrician understands the minimum requirements of the Code. Special 4 Book Offer for the "Electrician"
The Electrician's Workbook. I started my electrical apprenticeship in 1956. Back in those days you were studying to become a skilled craftsman in a trade. Back then you were taught to "train your brain before you test it." Now after 60 years in the electrical industry I'm not sure what is being taught and tested. I'm not sure how many "electricians" are out there. Many are referred today as "electrical workers" or "installers." It is my personal opinion that this book contains the type of exam questions a person should be asked to determine if they have the cognitive knowledge to install an electrical circuit properly. This is an excellent book for an apprentice or training class as it contains exams with answers in which to grade the student. Industrial Electrician Workbook. The workbook for the electrical person working in the electrical industry. This book contains over 1000 closed book questions, 43 closed book electrical exams with answers, questions on reading a multimeter, reading a megohmmeter, ground detectors, troubleshooting control circuits, safety and tool questions, three-phase transformers, etc. 316 pages. Troubleshooting Electrical Circuits Workbook. I wrote this book to introduce troubleshooting so the electrician can keep the lights on and the machinery running. I have found in my travels and teaching, from the questions being asked to me, that there is a definite need for a book on troubleshooting electrical circuits. The Electricians Reference Book. Now you will have a reference book to put in your pocket that will explain whether the receptacle grounding pin is installed "up" or "down." The minimum height of a paddle fan, the location of smoke detectors, exit and emergency lights, rules for the drilling and notching of studs, rafters and joists, when to pigtail a receptacle wire, depth of conduit in a concrete slab. Plus you'll have all the conduit, box fill, voltage drop, motors, transformer, wire sizing tables, conduit bending charts, burial depths, service conductor heights and much more! If you are studying for an electrical exam, check out our Book Combos. We have different combos for both Journeyman & Master exams. These are book packages that will actually Save you 20-30% off the regular price. Discount and savings vary. If you have any questions on how our books can help you get prepared call us at 1-800-642-2633. ©Copyright 2019 by Code Electrical Classes Inc.